It has been well-documented that the Texas Rangers organization seeks talent from anywhere at any level. Over the past several years, the Hickory Crawdads have benefitted from that philosophy. Rangers pitcher Nick Martinez came to the Crawdads in 2012 after throwing only 26 innings in college. Former manager Bill Richardson – who led the team to two playoff spots – was a high school coach at the time the Rangers hired him. On this year’s squad, the Crawdads have several individuals that are further examples of finding individuals in one field to do a specific job in another. Catcher Jose Trevino was a shortstop his final season at Oral Roberts. Pitcher Scott Williams was a junior college catcher that threw ten innings in 2014. He had ten saves in the second half of this season. 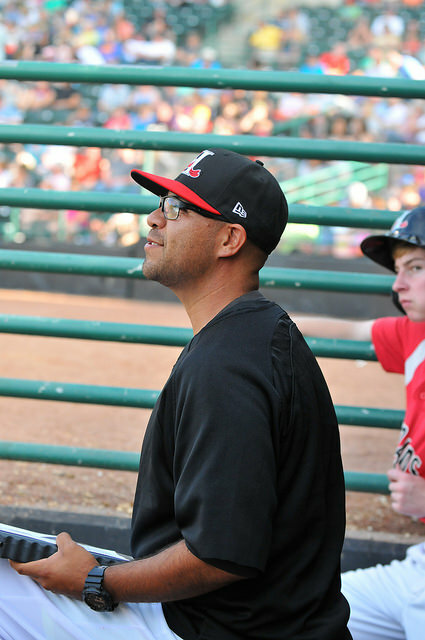 But arguably the biggest impact such a person has made for this year’s team has been pitching coach Oscar Marin, who was just named the South Atlantic League’s (SAL) coach of the year. A native of Southern California, Marin, 32, played college ball at L.A. Valley College (LAVS) before moving up to Arkansas-Little Rock. After his playing days ended, he stayed on as an assistant for a year in 2005 before returning to LAVC as its pitching coach for two seasons. Marin then was the pitching coach in 2008-2009 for Harvard-Westlake High in North Hollywood. The Rangers hired Marin in 2010 and he worked his way up to low-A Hickory for the first of two seasons starting in 2014. Marin has put in tremendous work this season and the results showed. 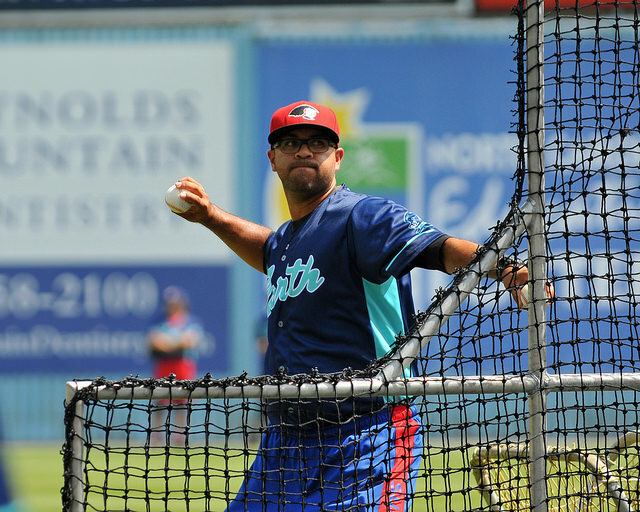 The Crawdads had six pitchers – four starters – selected for the mid-season SAL all-star game, with Marin himself picked as the pitching coach. The staff finished the season with club records in ERA (3.19) and WHIP (1.21), and were just two homers shy of setting a club mark in that category. In the interview below, Marin talked about the work his pitchers did this season, and he spoke of the process of becoming a pro coach without pro-playing experience. You got chosen as the South Atlantic League coach of the year. Where you surprised? Marin: Yeah, I was surprised. It’s something you don’t expect. But, it’s a great honor to know that your peers think that much of you. A lot of it’s due to the pitching staff that we’ve had that has given me the opportunity to do the things that we did this year. I’m just really excited about it and really happy about the award. I’m just thanking some of the people like our coordinator Danny Clark, Mark Connor that’s been with us, and Jeff Andrews have really kind of helped me throughout my career along the way here with the Rangers. A lot of credit goes to them too, but I’m really happy about it and blessed that I was able to get an award like that. Your guys have set the club ERA mark and the club WHIP mark. That’s probably a testament to your work and some of the coordinators that you’ve mentioned. What have you been able to instill in these guys this year as a total staff? Marin: I think as a team staff – and one of the things that we keep reminding these guys of – is how aggressive we started in the season after the first week. After the first week, we didn’t do so well. It took us until a series in Asheville to really get going. From that series in Asheville, we really started pitching off our fastball, attacking off our fastball and demanding that inner part of the plate. I think that was a big testament to what these guys did throughout the year and are still trying to do. That’s one of the things we engrained in these guys and part of the things that we have in the Texas Rangers organization is attacking the zone, winning your 1-1 counts, throwing your first-pitch strikes. Those little philosophies might seem simple, but if these guys can execute those things they’ll probably be on the winning end of games. What’s been the biggest surprise for you this year, even for somebody that maybe even started slow and has really come on that jumps out for you? Marin: Ariel Jurado. You bring him in from the AZL the year before, you don’t really have expectations of what you might get. For him to suffer his first loss not too long ago, to be 12-1 and have the composure that he did on the mound and to be able to have the feel that he does, it’s a big surprise. Like I said, you don’t what’s going to happen, but when a guy like that comes in the first year and does something like that, it has to surprise you. How could it not? After watching a while and having for a certain amount of time, you get to see why he’s doing the things that he’s doing. The whole staff in general: how they’ve stayed together as a unit and they’ve backed each other up. That was huge. You don’t have many staffs that do that kind of stuff, but when they do they’re special. I think this is a special group. That’s why these guys did a good job of keeping together and holding each other accountable the whole year. You have so many guys that have come in and out this year, whether it’s promotions or injuries, or whatever. What has helped you to be able to individualize lessons and development for Jurado and Williams and Wiles and so on? Marin: I think it’s more of an environment that you put out there around these guys. I know that every guy is different. We don’t cookie-cut anybody for what they do. We work with what that have. In general, what we teach these guys, while these guys are together, is basically in the same idea. We put things in terms of the same idea with everybody and creating that dynamic about, this is what we do, this is what we’re all about. So whether you leave or whether you come in, that dynamic stays the same, even with the guys that are leftover. We lost several guys, especially from the bullpen. From those guys that are left, there’s a little of the philosophy behind, and these guys have taken it over and are teaching the guys coming in. I think that’s the biggest difference as to why we’ve been able to do the things we’ve done this year. You come in or you leave, everybody’s getting, “this is what we do here.” I think that’s the biggest thing that’s helped. What were the adjustments, or maybe the biggest adjustments you had to make going to the pro level as opposed to the amateur level? Marin: I think the biggest adjustment for me was, at the high school level or at the junior college level, you get who you get. You’re kind of stuck trying to recruit in high school and guys get into the school or they don’t. They show up and there’s a tryout and that’s what you get. Here, the amount of talent that we get brought in, it was a lot easier to teach guys that might have more of that ability and not really have to go around and do different things to try and teach somebody. The learning curve is a lot easier. I think that was one of the biggest adjustments. The other thing was you have that first rounder, second rounder and different type guys. You’re used to teaching; this is how we do it- this one way. Because of the people I’ve been around and the guys that I’ve already mentioned – like coordinator Danny Clark – you learn different ways on how to teach different guys. Not everybody’s going to be the same. I think that was the biggest adjustment coming into pro ball. Everybody has their own personalities and you find the best way to try to teach those personalities. Did you have to earn respect coming into the pro game? Did you have to learn a certain level of being listened to? Marin: I think everybody tries to earn that respect. The best thing about this organization is you earn that respect by working hard and making sure you’re doing the things to get guys better. That’s how you earn their respect. There wasn’t really too much of that, “this guy didn’t play professional baseball.” I never saw that. I think that’s one of the best things that our organization does. There’s not bad talk about, “this guy never played.” Everybody just came together. If you’re here to get somebody better, that’s what they care about and that’s why I love this organization. You’ve been here two years now. What do you know now in September of your second year that you maybe didn’t know in April of 2014? Marin: I think the biggest thing is – going from short-season ball, where I was at before, whether it was the AZL or at Spokane – limiting what these guys do. Throughout the year, you might start of doing certain things, working heavier with guys on certain things, whether it’s mechanics or a certain pitch and stuff like that and you keep doing it throughout the year. But over time, if they keeping doing those, those guys are going to wear down. Over time, just training responsibly and having those guys keep doing the things that they need to do to get better. Instead of overworking, just more quality work than anything else. Looking ahead, what do you see yourself doing in three to five years? Do you look to keep moving up, or do you have a niche here? Marin: This is a great place and I love coaching here. This isn’t a bad place to coach, whatsoever. But like anybody else, just like the players do, you have those thoughts of moving up. You have those thoughts of eventually, just like everybody else, having an idea of coaching in the big leagues and getting to the big leagues in whatever capacity it is. That’s what I want to be. I want to keep growing as a person. I want to keep growing as a pitching coach and try to move up as much as much I can and try to succeed at some of the things you wanted. One of the other things is eventually – I guess you can call it a five-year plan –be a pitching coordinator. I want to keep growing and I want to keep growing in whatever capacity that’s gets me moving up to the next level.